New York/ Chandigarh: The World Sikh Convention was held in New York on 3rd March 2018. According to the organisers, the event was a huge success. A written statement issued by the organisers of the event many Panthic Sikh organizations from around the world came together to discuss building the World Sikh Parliament. “Sixteen (16) countries have put forward candidates for the World Sikh Parliament. Jathedar Jagtar Singh Hawara will announce co-ordination committee for Punjab and rest of India at Vaisakhi 2018”, the statement reads. Meeting Held on August 2017 in Birmingham, UK decided that it is essential to setup World Sikh Parliament to provide direction and resolve issues in global Sikh Affairs for future generations. “Sri Akal Takht Sahib Jathedar Jagtar Singh Hawara has asked all of the Khalsa Panth to come together and make this dream a reality. Answering this call, a diverse range of Sikh activists, Jathebandis, organizations and Gurdwara representatives from around the World, attended the two day World Sikh Convention in New York”, the statement reads. The Convention started with Ardas and then a letter from Bhai Jagtar Singh Hawara was read out by his lawyer Advocate Amar Singh Chahal. 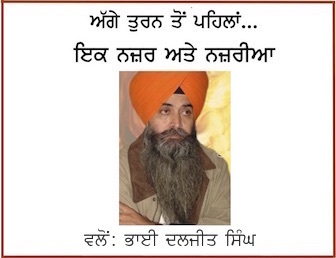 Support letter from Harpal Singh Cheema, Dal Khalsa was read by Dr Ranjit Singh. Other Supportive letters/videos from Bhai Ram Singh Damdami Taksal, Ex- Jathedar Siri Akal Thakht Sahib Joginder Singh Vedanti, Bhai Satnam Singh Khanda (Panj Singhs), Bhai Joga Singh UK, Bhai Manpreet Singh UK, Satkaar Committee Vancouver, Ranjit Singh Sarai & Amrik Singh Sahota (Council of Khalistan UK), Atinderpal Singh, Advocate Navkiran Singh Chandigarh, J S Alhuwalia Chandigah, Baljit Singh Khalsa (Wangar Magazine), Jasdev Singh (Supreme Council, Fremont USA), and many others Panthic personalities were shared with participants. The organisers of the World Sikh Convention said: “A significant mandate was given for progressing with its formation. Issues such as including representatives from sections of global sikh community, including Wanjara, Sikhligar Sikhs, Afghani Sikhs, etc as part of an inclusive approach to counter the divisions that are being created by Radical Hindutava policies. The convention has requested all active Sikh youth activists, female Sikh activists and any remaining sikh organizations to come and be a part of this progress to the formation of the World Sikh Parliament. The Convention made a clear commitment to the formation of Sikh homeland Khalistan as an aim”. Organizers of the event said Dupinderjit Singh announced the 13 members from UK for the WSP and Bhai Jaswinder Singh announced the 14 members of WSP from Europe. The statement, however, did not mention names of these members. From (L) To (R) Dr Gurdarshan Singh Dillon, Dr Amarjit Singh. “This now brings total number of World Sikh Parliament representatives to 94 from 16 countries with a further 56 places left from outside India and 150 from India. Nominations for this places are open to all global Sikh organizations that wish to participate in this process. Jathedar Jagtar Singh Hawara is himself announcing the 15 member working committee to select the India and Punjab representatives at Vaisakhi 2018” the statement reads. 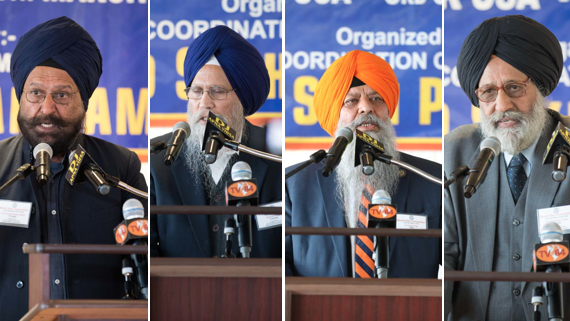 Participants to this convention included Dr Amarjit Singh & Kuldip Singh, Swarnjit Singh Connecticut, Daljit Singh Stockton, Dr Pritpal Singh (American Gurdwara Parbandak Committee), Karnail Singh, Dr Shamsher Singh, Dr Hardam Singh Azaad, Dr Amrit Singh, Harjinder Singh, Sukhwinder Singh, Baljinder Singh, Hardyal Singh (United Sikhs), Gurdev Singh Maan, Bibi Sarbjit Kaur, Bibi Gurmeet Kaur, Balwant Singh, Baljinder Singh Seattle, Narinder Singh Virginia, Jasjit Singh Khalsa, Sampuran Singh Houston, Jaswant Singh Hothi and many others from USA. From Punjab, participants included Advocate Amar Singh Chahal, Surinder Singh (Talking Punjab), Professor Harpal Singh, Dr Gurdashan Singh Dhillon Easher Singh and Sukhwinder Singh Nagoke. From Australia, Bhai Sham Singh (Australia Gurdwara Pandak committee),Maninder Singh, Giani Kuldeep Singh, Sukhrajwinder Singh, Daljinder Singh Brisbane, Gurvinder Singh Melbourne. From New Zealand, attendees included Gurmel Singh and Daljinder Singh. Canadian representatives included Kuldip Singh, Sukhdev Singh, Satnam Singh, Bhagat Singh Bhandal and Kulvir Singh. UK representatives included Jagjit Singh, Dupinderjit Singh and Jagveer Singh. Germany was represented by Gurcharan Singh (Frankfurt Gurdwara) and Narinder Singh. Italian Gurdwaras representative, Jasvir Singh participated along with Jaswinder Singh from Holland.